If you are a keen outdoorsman, hiker, backpacker or hunter, then you already know that an altimeter watch is a piece of gear you should have in your kit at all times. When you are on a daring adventure, you need every bit of information about your environment, and what better way to go about that than having the best altimeter watch? Fishers, hunters, hikers, pilots, vertical athletes, and mountaineers can benefit from data such as location and altitude which are provided by these watches. A customary model of altimeter watch has three essential functions; altimeter, barometer, and compass. Nevertheless, there are various types of altimeter watches available, ranging from those with basic functions to those feature-stacked ones. So buying one might not be the simplest task. Fortunately, we are here to help! In this article, we have compiled a list of the best altimeter watches you can find on the market, and we also discussed the various factors you need to take into consideration before buying this type of watch. Let’s take a closer look! If you worry about the climate change that means you must consider buying an altimeter watch with a barometer feature. Whether you are cycling, skiing, hiking, or just exploring unfamiliar landscape, charting barometric pressure is very important. Furthermore, although you could simply purchase a compass separately, it just bodes well to go for a watch that comes with all the bells and whistles, including a reliable and great compass. Choose models that come with 3D compass technology in case you are a genuine cross-country explorer; if not, a great digital compass will do the trick. The battery life is another pivotal factor you should take into consideration when purchasing an altimeter watch. An adventurer needs a watch with a long lasting battery that will last for a day at least. A customary solar-powered altimeter watch lasts for a prolonged period. Nonetheless, these watches are usually stacked with all the battery draining features, so it is hard to find one that will last you for over two days. The best battery life currently in the market is around 32 hours. Another thing that is usually ignored by the majority of buyers is how comfortable the watch feels on their wrist. All things considered, you wouldn’t want the watch to make you feel uncomfortable as you are wearing it most of the time. While some altimeter watches might be somewhat bigger or bulkier than others, there are tons of altimeter watches that have been built with comfort in mind. Therefore, make sure you go for a watch that feels good on your wrist. A watch may have all the bells and whistle but it should be also simple to operate with no unnecessary intricacies at the same time. The buttons need to be placed in a position where it would be easy to press them. It is also important to consider the design of the watch. The user should not wind up feeling that it is something near advanced science to figure out how to use an altimeter watch. Also, it is important to consider the display of the watch as it is where the user reads all the significant information. An altimeter watch with a decent display quality has a moderately huge screen with great text styles and sizes. In addition, you should go for a watch that you can change the display background colors so that you can quickly and easily read relevant information in any kind of situation. It is very important to be able to quickly take a look at the watch and read the information, particularly if you are paying attention to something else while exploring nature. While some put more focus on style than practicality, majority of manufacturers keep the user in mind. Most times, this is maybe the first criteria considered by most people when buying a good altimeter watch. Although there are some very costly ones, there are also some that will fit any budget and have the required quality. Of course, the more features the watch has, the more expensive it can get. Also true when you’re considering high-end brands. Below we reviewed 8 of the best altimeter watches available on the market right now. We checked their features and reviewed their pros and cons so you can make an informed decision. The Suunto Ambit 3 Peak Sport Watch is a strong option in Suunto’s line-up. The watch is especially made for sports training, however, you can also employ it in various other functions such as mountain biking and hiking. It offers an extremely precise altimeter that records information at regular intervals and will display the last 24 hours in graph format by the push of a button. Also, the compass incorporated in the watch works at any angle, so your wrist doesn’t have to be leveled in order to get a precise reading, unlike a magnetic compass. The compass’ heading displays plainly visible degrees. However, you will have to manually set declination. This watch is different to many other ABC watches due to the fact that its altimeter is accurate, but still should be calibrated as often as possible. You can make use of the FusedAlti function to make the adjustment. You can easily use the large, user friendly buttons to switch between screens, even when you are wearing gloves. Besides, the watch also comes with a clear and easy to read display that features a backlight for low light situations. Regardless of what you require GPS for, biking, hiking, marathons or kayaking, the Ambit3 is an awesome choice. The watch is likewise waterproof rated for more than 300 feet (100 m) which means it can even be used for diving or snorkelling. Related: Do you have a problem with the follow-come strap of your Ambit3? We recommend you to purchase the ArmyTalk Watch Band Strap. It feels very comfortable on the wrist and its long lasting. Wearing the Garmin Fenix 5 Sport Watch is like strapping a computer to your wrist. The price tag and functionality certainly have likenesses to your PC. Notwithstanding, the ruggedness and streamlined size make these watches perfect for keeping tab on your fitness levels whether you are paddling, boarding, running a marathon, playing golf or hiking the Rockies. Made for more than the average gym-goer, the Fenix 5 is built with more focus on the adventurers. This excellent watch can be worn by just anyone, but its GPS capabilities, waterproof exterior, and Sapphire lens option make it perfect for the keen outdoorsmen and hikers. Surprisingly, this watch doesn’t have a touch screen. Although a touch screen’s simplicity and easy is a bonus for some watches from the lower-end, the Fenix 5 is made for genuine outdoor activities. It wouldn’t be easy to be touching a screen while finding your way in wet conditions or wearing gloves. As a result of that, Garmin has made this watch controllable with user friendly buttons beside the face. In addition, Garmin has incorporated its improved Elevate wrist heart rate monitor. This heart rate monitor on the Fenix 5 is said to be more accurate than previous models. The monitor is placed on a sturdy stainless steel backing and is completely incorporated into the back of the watch. Some other great features of the Fenix 5 include an altimeter, compass, and activity applications for hiking, climbing, skiing, running, cycling, swimming, gold and paddling. Information that is recorded on the watch, like heart rate, is saved on Garmin Connect automatically. Besides, the watch can also be customized with data fields, widgets and apps from Connect IQ. All these features make the Fenix 5 to be more than just a running watch. Perhaps, this is the best watch ever made. Related: The Fenix 5 is an expensive watch, and you need to protect it against drops and knocks while on your adventures. We recommend you to purchase the highly reliable and solid Garmin Fenix 5 Screen Protector to give your watch some worthy protection. The Casio Pathfinder Sport Watch is another impressive sport watch from Casio. Casio is widely renowned for being makers of some of the best watches in the world, and on the evidence of the PAG240B, they don’t seem to be resting on their laurels, not anytime soon. The PAG240B Pathfinder Sport Watch, despite its moderate price tag, comes with a lot of exciting features. Obviously, it features the altimeter, digital barometer, and compass readings, and also backlight, world time for 48 cities, countdown timer, and many more. One of the most loved features of the PAG240B is the lightweight titanium band which reduces the weight of this watch. In addition, users of the watch are contented with the size and look of the watch. The watch is large and it has a lot of quality on your wrist. Additionally, the watch is powered by solar, so you don’t have to worry about replacing the batteries every now and again. Generally speaking, when searching for a strong ABC watch that will perform admirably for quite a while, it appears that the Casio Pathfinder might be the ideal watch for you. Related: Customers who bought the PAG240B Pathfinder found useful the Casio Pathfinder PAG-40 Replacement Band. As it name suggests, it is a replacement band that might come handy in the event that your watch outlives the follow-come band. Sunto is a leader when it comes to the manufacturing of sport watches, and the Suunto Core Sport Watch is another impressive product. 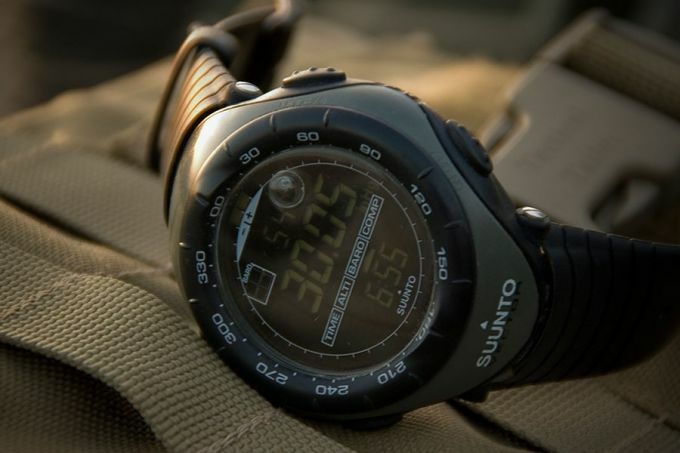 In the Suunto Core, the altimeter and barometer are connected, providing the user with more precise readings. This sport watch also features an altitude log, which is a frequently used feature by users. Furthermore, the watch shows the altitude readings of one week, like the aggregate number of ascent and descent. Besides, it is waterproof up to 30 meters, which means it can be used for snorkelling and diving. The screen can be locked while you going about your outdoor activities. In addition, the watch tells you when the sun is rising or setting, which is helpful when you are on your wild adventure. Suunto Core comes with a weather indicator, and its alarm goes off when it senses a storm approaching. The band is manufactured using elastomer, and the compact and small size makes it comfortable on the wrist. Besides, the watch comes with a clear and easy to read display which is made from mineral glass crystal. Related: If your Sunto Core ever requires a new strap, the Suunto Core Strap is the perfect replacement band. The Casio SGW300HB-3AVCF Sport Watch comes with many useful features, despite its low price. It comes with exciting features like altimeter, barometer, world time, thermometer, countdown timer, and many more. Although, in Casio’s attempt to make the watch look rugged by exposing the screws on the bezel, the watch rather looks cheap. Also, the woven, green nylon band gives the watch a general look of cheaply designed watch. While this watch is not really bad looking, it is not the most beautiful watch on our list. While the altimeter isn’t completely precise, it is still one of the best altimeter watches in the price range and perfect for beginners. Also, it comes with great features such as an accurate thermometer and a barometer. The stopwatch and the countdown are anything but difficult to set and use, and you can set the watch to 12 or 24-hour format or set it to utilize world time. Besides, it is water resistant up to 100 meters, but make sure you don’t use the buttons submerged. To wrap things up, the LED light is great, and the five alarms are sufficient regardless of the fact that they are somewhat quiet. Unfortunately, the watch doesn’t come with a compass and an option for alarm vibration, and also, the screen gets scratched easily. However, it is still reliable and it comes for a good price and we think it is ideal for teenagers or people who don’t care about the fairly low-quality look. Related: If you would prefer a watch from Casio with more bells and whistles, we recommend the Casio Pathfinder Triple Sensor Watch. It is a sturdy watch with a lot of useful features like sunrise-sunset data, solar power and more. Launched in 2015, the Suunto Traverse Fitness Watch instantly became a hit among outdoorsmen, hikers, mountaineers, and backpackers upon its release. The watch has a very beautiful and attractive design and it comes with a variety of useful features. The design is a bit different to that of the Ambit as it looks more stylish than sporty. The difference in design also means this watch doesn’t come with sporty features such as multi-sport mode and advanced training analysis. However, these are features not in any way required by outdoorsmen. Therefore, instead of the sporty features, it comes with great outdoor-related features such as a pedometer, vibrational alerts, GLONASS navigation and flashback lights. In addition, the Traverse will connect with your smartphone via wireless Bluetooth and provides some other great features such as an altimeter, barometer, digital compass, and more. In general, this is an awesome outdoor watch that comes with many practical and useful features, and to put the icing on the cake, it is suitable for everyday use as it has a very sleek and beautiful look. Related: The Sunto Traverse is a fairly expensive watch and that is why you should have it protected. We recommend the Suunto Traverse Screen Protector which is especially made for this watch. The Garmin Fenix 2 is still an incredible choice for anybody on a budget. Despite its affordable price compared to other fitness watches, the watch comes with a lot of great features found in more expensive models. This is a great option for people that will employ it essentially for fitness training. The watch performs admirably and it comes with a lot of features such as altimeter, barometer, compass, and sky mode, and it also comes with features for tracking your swimming strokes and running dynamics, making it ideal for fitness training and outdoor activities. Furthermore, the watch has a strong battery that can last for 50 hours when in GPS mode and you can charge it via USB. This watch is an incredible, budget-friendly watch that is suitable for outdoorsmen and gym-goers alike. Related: In the event that your watch ever requires a new band, we recommend the highly durable Garmin Fenix Replacement Band. It is sturdy and will last for a long time. The Casio Pro Trek Watch is designed for the hard-core mountaineer. From various perspectives, this is one of the most reliable and most attractive watches a mountaineer could get. With this watch, Casio presented the idea of a lightweight, carbon fiber look for the selective client. The watch comes with a lot of features such as altimeter, barometer, compass, stopwatch and countdown timer. Other than being a feature-packed watch, it also has a very stylish and strong design. The watch has an easy to read and clear display, and the display also has a double LED light for extra readability in all kinds of conditions. The triple sensor includes an altimeter, a barometer, a thermometer, and a compass. While it is difficult to be sure of the accuracy of these sensors, they provide estimative values. For instance, the thermometer provides unreliable results when you are wearing the watch because of the heat your hand is emitting. The barometer or altimeter, while helpful to measure the pressure and the altitude at a specific time, can be used in professional assignments. However, the compass is fairly precise. It is not necessarily to say that the triple sensor isn’t helpful, but you should know that these features can’t fully replace professional tools. In conclusion, this timepiece is an extraordinary pick for people in search of a decent watch from Casio with several great features. If you are looking for a lightweight and long lasting watch, then this watch is the most ideal for you. Related: This watch can be recharged with solar power, however, if you want to avoid charging it in the hot summer sun, you can use the CoolFire Solar Watch Fast Charger for backup. It replaces the summer rays with non-heating option to fast charge your solar watch. There are loads of altimeter watches in the market and more are being released almost every week. Consider your essential needs such as battery life, features, connectivity, and some other thing like we discussed earlier in the article. Different people have different needs and styles so opt for the watch that will ideal for you. Here, we have selected 8 of the best altimeter watches that are suitable for outdoorsmen and with varying brands, models, and features, we hope you will find one that best suits your needs. Have you come across any of the watches on our list before? Tell us about your experience in the comments section below.